Samhain ( /ˈsɑːwɪn/, /ˈsaʊ.ɪn/, or /ˈsaʊn/) is a Gaelic harvest festival held on October 31–November 1. It was linked to festivals held around the same time in other Celtic cultures […] and both the Gaelic and the Catholic liturgical festival have influenced the secular customs now connected with Halloween. Yes, it ‘s whitchcraft, but we love it! So, for all Lubuntu users and lovers, I made a special version of the Quantal Quetzal wallpaper to download. Just click on the image to make it bigger (1280 x 1024 px). 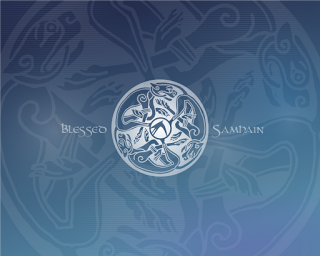 Blessed Samhain to everybody! Shona Oíche Shamhna!